Result: Lukas Lacko defeated Cameron Norrie by 6-3, 6-4. It was an exciting match to watch as both the players gave a very good performance throughout the match. The Slovak player, Lukas Lacko opened the scoring of the first set and was extending it at a very fast pace. However, Cameron Norrie on the other hand, was struggling hard to recover the points. In the end, Lukas Lacko finally claimed the victory in the first set and the match moved on to the next set. In the second set, Cameron Norrie took the lead this time. However, both the players were scoring at a very fast pace. Breakthrough week continues for 30-year-old @LukiLacko at #NatureValleyInternational. World No. 94 beats Cameron Norrie 6-3 6-4 to improve to 2-11 in @ATPWorldTour QFs (2012 Zagreb RUP). Yesterday, Lacko beat No. 11 Diego Schwartzman for biggest win of career (2-37 vs. Top 20). Cameron Norrie was playing confidently but he lost some points in the end and failed to make it to the next round. Lukas Lacko booked his place into the Semi finals of Eastbourne Tennis Intl 2018 where he will play against Marco Cecchinato. Result: Marco Cecchinato defeated John Millman by 5-7, 6-3, 6-2. An exquisite performance was witnessed today between Marco Cecchinato and John Millman as they both gave their best performance today. Marco Cecchinato opened the scoring of the first set and was scoring points quickly. On the other hand, John Millman was also scoring points and eventually the score was equalized 5-5 after some time. At last, John Millman secured his win in the first set by scoring the last two points in a quick succession. In the second set, Marco Cecchinato again took the lead but this time he was extending it at a very fast pace. John Millman struggled hard to recover the lead, but despite his hard work and good efforts, he lost it by three points in the end. Now it was all down to the third set for both the players. Marco Cecchinato took the lead in the decisive set when John Millman failed to score the first point. However, bad luck continued for the Australian player, John as he faced a humiliating defeat by 6-2 in the end. Marco Cecchinato will now face Lukas Lacko in the Quarter finals of Eastbourne Tennis Intl 2018. Result: Agnieszka Radwanska defeated Jelena Ostapenko by 6-2, 7-5. A breathtaking performance was witnessed by Agnieszka Radwanska as she defeated Jelena Ostapenko in both the sets. Agnieszka Radwanska opened the scoring of the first set and was scoring points very quickly. The 21-year old Latvia star, Jelena Ostapenko lost many points on her serve and eventually faced a humiliating defeat by a total of four points. Agnieszka Radwanska again took the lead in the second set but this time Jelena Ostapenko was also scoring points quickly. Both the players lost a total of three points on their serve as the score reached 5-5. But in the end, Agnieszka Radwanska finally scored the last two points with some powerful backhand shots and sealed her victory in tis set. Agnieszka Radwanska booked her place into the Semi finals of Eastbourne Tennis Intl 2018 where she will play against Aryna Sabalenka. Result: Aryna Sabalenka defeated Karolina Pliskova by 6-3, 2-6, 7-6(5). What an absolute and exquisite performance was witnessed between Aryna Sabalenka and Karolina Pliskova throughout the match. The Belarus professional, Aryna Sabalenka opened the scoring of the first set and was extending it at a very swift pace. Karolina Pliskova however, managed to recover some points but lost the set by three points in the end. The second set started and this time Karolina Pliskova took the lead as Aryna failed to score on her serve. The moment @SabalenkaA knocked out the defending champion Karolina #Pliskova at the #NatureValleyInternational! Who will claim the 2018 title? Karolina Pliskova gave her best in this set and Aryna Sabalenka faced a humiliating defeat in the second set by 6-2. Aryna Sabalenka stunned defending champion Karolina Pliskova to reach the semi-finals at Eastbourne. After a very tough fight, the set came to the tie-break and the Czech star, Karolina Pliskova failed to win the set as she lost a total of three points on the tie-break. Aryna Sabalenka finally made it to the Semi finals of Eastbourne Tennis Intl 2018 where she will face Agnieszka Radwanska. Result: Jonny O’Mara and Luke Bambridge defeated Edouard Roger-Vasselin and Robert Lindstedt by 6-4, 6-3. Jonny O’Mara and Luke Bambridge took the lead in the opening set of the match and were extending it at a very fast pace. However, Edouard Roger-Vasselin and Robert Lindstedt were also scoring points quickly. But in the end, Jonny O’Mara and Luke Bambridge scored the last two points in a quick succession as Edouard Roger-Vasselin and Robert Lindstedt failed to score on the serve. The next set started after a short break and again Jonny O’Mara and Luke Bambridge opened the scoring of this set. However, Edouard Roger-Vasselin and Robert Lindstedt struggled very hard to win this set but they were only able to recover a total of three points. THEY’VE DONE IT!! @Jonny_OMara & @Bambo290 are into the #NatureValleyInternational final! 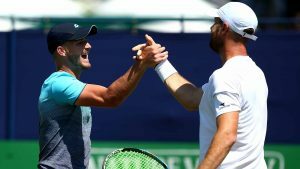 Jonny O’Mara and Luke Bambridge finally booked their place into the final of Eastbourne Tennis Intl 2018 where they will play against the British players, Neal Skupski and Ken Skupski. Result: Ekaterina Makarova and Nadiia Kichenok defeated Elise Mertens and Demi Schuurs by 6-2, 2-1. Ekaterina Makarova and Nadiia Kichenok opened the scoring of the first set as Elise Mertens and Demi Schuurs failed to score on their serve. However, Elise Mertens and Demi Schuurs both lost a total of three serves which costed them the first set. The match moved on to the next set and again Ekaterina Makarova and Nadiia Kichenok took the lead. However, Elise Mertens and Demi Schuurs both retired after Elise got an injury on his shoulder. Ekaterina Makarova and Nadiia Kichenok finally moved to the Semi finals of Eastbourne Tennis Intl 2018 where they will face Irina-Camelia Begu and Mihaela Buzarnescu. Still a great training for next week. Previous articleBreaking – Eastbourne Tennis Intl 2018 Quarter final: Edmund vs Mikhail; Who Won?